Located on Reid Street, De Pere, Wisconsin – sitting ironically next to the train tracks, you'll find what looks to be a train station. Look again and you'll notice an artfully designed restaurant, The Nicolet Restaurant. 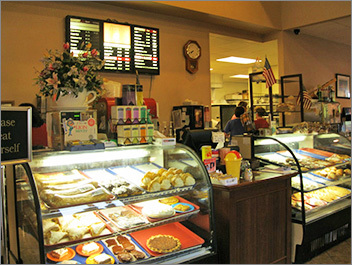 A local favorite, the Nicolet Restaurant serves breakfast with texas toast, premium coffee and home made bakery. Definately a step above your typical diner experience. From panini's and burgers, to old-fashioned potroast and roast turkey… the menu offers a broad quality selection with kids menu choices - something for the whole family! Here's a great place for a real breakfast. The portions are large, the coffee keeps coming and the bread is home made and thickly sliced. It still has a smoking section :(, but even after a packer game when the place is packed there is hardly a soul smoking. Besides, after the Wisconsin laws pass it will be out. For breakfast I went to dine at Nicolet restaurant which is located in east De Pere. As you walk in the first thing that you see are two large clear glass cases filled with homemade humongous cream puffs, doughnuts, pies, and delicious pastries yummy. It is a large bright and immaculate building with a high beamed ceiling in the center of the room and for seating there is a very long counter and numerous booths which are all situated by windows. The light fixtures are frosted and there is one directly over each booth for good lighting, the décor is all very tastefully done. My server was polite and friendly, I ordered off their breakfast menu a cup of coffee for $1.28 and a single order of eggs benedict for $4.99. I was brought ice water and a cup of coffee but no thermos of extra coffee to accompany it. Some breakfast restaurants offer the convenience of an extra thermos. I had a choice of hash browns or American fries and I chose the American fries. My breakfast looked scrumptious and it was; the American fries were fried nicely, evenly browned with a rich seasoned flavor. 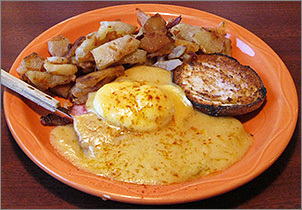 The English muffin was dense and toasted to a light brown with melted butter spread evenly over it, the ham was not Canadian style, instead it was a very large piece of fried baked ham with one over medium done egg with the hollandaise sauce poured over it. Now my server never asked me how I would like my egg done but fortunately it was cooked well not too runny or over done. The sauce tasted good but it did not have the distinct creamy lemony burst of flavor emanating from it. Nicolet also offers lunch and dinner off their menu.